Gardeners and busy plant-loving home makers will be happy that a new plant sensor will soon arrive at market which can measure different needs of plants and advise accordingly. Parrot's Flower Power is the new wireless device which can be placed in the soil of an indoor or outdoor plant to measure moisture in the soil, need for sunshine, fertilizer requirement etc. It uses Bluetooth to send the information to an application of iPhone or iPad. 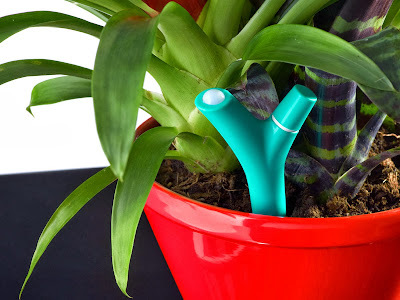 The 'Y' shaped device is small and can be placed easily in the plant's soil. The collected data is stored in the device's flash memory till it is within a Bluetooth range for connection. The application has a library of 6000 plants with information and advice on each plant. According to the declaration, the device includes 6 months' battery life from AAA battery. The Flower Power will be available from November, 2013 for USD 59.99.